[b:Children of Morrow|414454|Children of Morrow|Helen Mary Hoover|http://d.gr-assets.com/books/1186617889s/414454.jpg|403672] was a favorite when I was younger. It’s a post-apocalypse YA novel about two mutant children who flee the murderous intentions of their village’s mayor and his henchman. I reread it about a decade ago and found that it held up rather well. It was thus that when I resolved to read The Dawn Palace (part of my recent fixation with Greek myths – see my reviews of The Iliad (Mitchell trans. ), The Odyssey (Fagles trans. ), For Her Dark Skin (Everett), Ransom (Malouf) and Medea (Wolf), among others) I was confident that I would like the story. I’m happy to report that not only did I like the story, I liked it a lot. I thought this was one of the better interpretations of the Jason/Medea legend, and – despite its target audience of older YAs – it can appeal to adults as well. 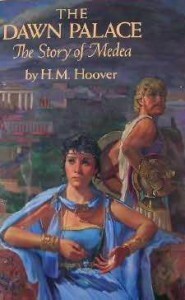 Hoover wisely – I think – elects to make Medea a 14-year-old girl, and Jason is not many years older. She is the daughter of Asterodeia, the daughter of Helios the sun god, and Aeëtes, an expatriate Corinthian, who is king of Colchis from his marriage to her. The novel opens when Medea is five and sees a vision of her mother departing. Come the morning, she finds the court in mourning because Asterodeia has apparently died during the night. I say “apparently” because the child discovers that the covered body is not her mother’s. Asterodeia has gone back to her father, leaving Aeëtes to rule as regent for Medea (so she thinks). The years pass. Medea’s aunt Circe teaches her about herbs, magic and other knowledge astrally, visiting her in dreams and taking her to a timeless place where they she can study and learn undistracted. This is a time of change, however. The ancient matriarchal dynasties and the goddess-centered religion are being displaced by patriarchs and the male-centered Olympian pantheon. Aeëtes has remarried and plans to put Apsyrtus, the son of that union, on the throne. Medea learns of the betrayal shortly before Colchis is honored by the arrival of Jason and his Argonauts. Hurt, betrayed and feeling lost, Medea falls hard for the charming, unscrupulous and handsome Greek. Subsequently, the story departs from the received version (i.e., Euripides’) of the legend by making Jason solely responsible for killing Apsyrtus and it is he who murders his and Medea’s children. But it doesn’t exonerate Medea. Before she finally realizes his true nature, she does great evil because of her love for the man. The dark form moved. Living wood creaked and broke. Rocks chinked and sparks flew. Flames licked up and grew bright, and the smell of burning cedar pitch mingled with the salt air. When he raised the flaming fatwood brand, she saw him clearly. He warns her that Jason will betray her just as he betrayed him because they are both children of the gods, and promises to be a friend when that day comes. A promise that greatly disturbs Medea as she realizes he is on the knife-edge of madness and despair. Their second meeting occurs several years later. She and Jason and their children have found succor in Corinth with Creon, its king. Hercules’ madness “was more evident now. His throat moved as if he were carrying on an angry internal dialogue, obsessed by old injustices” (p. 178). He reiterates his friendship for her and that he’ll help when Jason inevitably abandons her. The final time they meet, Medea has fled Corinth, finally recognizing Jason for what he is and taking her revenge against him, Creon and Glauce. Hercules has murdered Deianeira, his wife, and his children. He’s holed up in his palace and so sunk into madness that “[h]e sat naked and hunched up, his huge arms hugging his knees so tightly that his muscles bulged and strained. His eyes were wide and unfocused; his jaws clenched, his throat working. As she watched, appalled, he began to rock in that spastic frenzy peculiar to lunatics. Faster and faster he rocked, until his heels were lifting higher with each backward lunge, and he finally tipped over and fell sideways, his head thudding against the roof” (pp. 203-4). She nurses him back to physical and mental health, and finds that – in the end – he can’t protect her and she must find the strength in herself to salvage what she can of her life. Hoover humanizes the elemental force of nature that is Hercules and makes the reader sympathize with his plight – a man who set out to do good in the world but whose every action turns out horribly wrong. As with Hercules, so with Medea. Over the course of the novel, Hoover creates a complex, believable and sympathetic character. As I mentioned, she commits evil but she’s also capable of good, and it’s never simply a question of doing the right thing since there’s no act she can do that won’t have maleficent consequences. I don’t have any specific passages that could illustrate my point. It’s a matter of the author’s ability to flesh out Medea’s character throughout the story but it works. Even more so than Hercules, Hoover’s Medea is a fully human person who readers empathize with even if they can’t always condone what she does. There are two further points I wanted to mention before closing out this review. The first is Hoover’s treatment of gods and magic. There certainly is an element of the supernatural; I’ve already mentioned how Circe visits Medea astrally. But, otherwise, the gods and magic are more noticeable in their absence. Much of Medea’s power comes from greater knowledge of the physical world. For example, she murders Glauce and Creon with a dress and crown seeded with white phosphorus. Her murder of Pelias is accomplished with stage magic and duplicity. And her skill as a physician, not spells, saves lives. I wasn’t sure if this worked when I first read the novel but upon reflection I think it does, for the most part. I personally like the ambiguity of not knowing if the gods exist or to what extent – if they do – that they interfere in human affairs. The second point is that if there is a weakness in this novel it’s that the author compresses the second half of the story (after Jason and Medea reach Greece), and it feels rushed and incomplete. I would have liked 50-100 pages more devoted to Medea’s life in Greece so that its sudden disruption would have had as much emotional “oomph” as the events of the first part. That aside, this novel comes highly recommended by yours truly (I’ll be sending a copy to my niece for her birthday), and it makes me intrigued about Hoover’s other work. Children of Morrow had already proved she could be an interesting writer but if her other work matches The Dawn Palace, I’m even more interested in seeking out her stuff.